Holiday Inn Club Vacations has turned five and they are celebrating this by offering 5,000 bonus points per night (minimum stay 2 nights) for stays between now and May 23, 2014. Note that you must book special “5000 Bonus Pts HICV” rate plan to be eligible for the bonus points and this is usually more expensive than the lowest available prepaid rates. 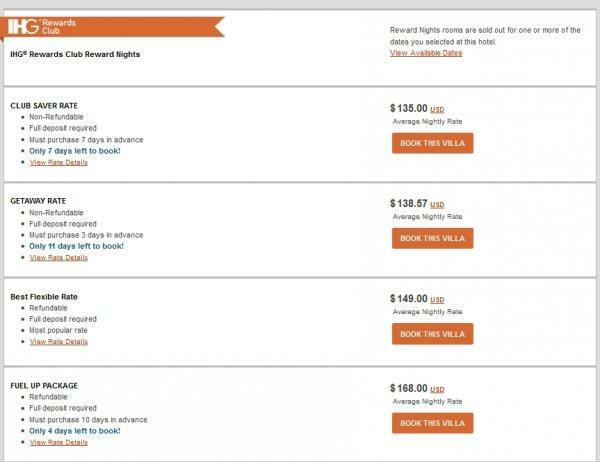 The 5,000 bonus point per night rate plan is $35 higher than the most discounted one. You should consider if it makes sense to pay this premium just to get the points. Sometimes it makes sense to pay the bonus points package rate, as these bonus points are elite qualifying. Must be a IHG® Rewards Club member or enroll prior to stay. Villas are available at Holiday Inn Club Vacations® Resorts. To receive the 5,000 bonus points during your stay, book the 5,000 Bonus Point Package rate (IKCV5) for a minimum of two (2) consecutive nights. Allow 4 weeks from the completion of your stay for bonus points to be posted to your account. No retroactive points will be awarded for nights stayed prior to enrollment. Miles earners will be awarded points. First night’s room and tax deposit required and is fully refundable if cancelled at least 72 hours prior to arrival. Lake Geneva Resort and Bay Point Resort in Panama City require full prepayment at the time of booking and is refundable 3 days prior to arrival. Rates and dates are subject to availability and may not be used in conjunction with any other offer. Offer valid on new bookings only, not applicable to groups and cannot be used in conjunction with any other offers or special promotions. Rates are non-commissionable to travel agents. Only one villa per member will be awarded the applicable points. Rates may vary by date of booking and are per villa, per night. Bookings are non-transferable. Rates do not include taxes, gratuities, or incidental charges, including food and beverages. A stay is one or more consecutive nights at the same hotel regardless of frequency of check-in/checkout.